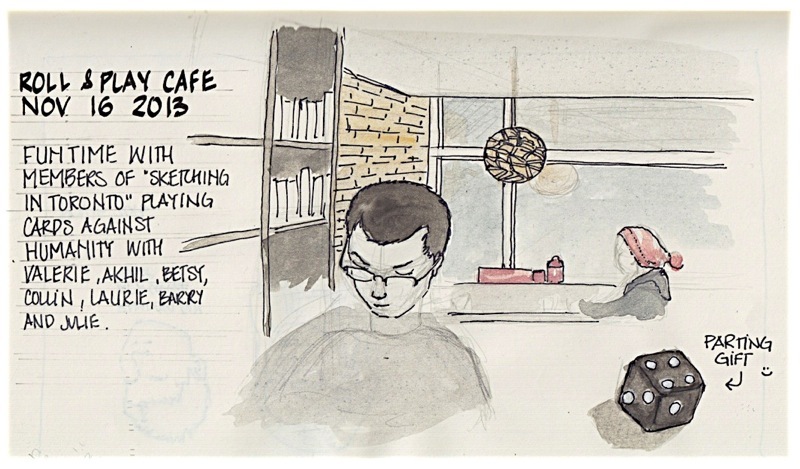 I met up with members of the Sketching in Toronto Meetup Group at a place called Roll Play Cafe. It's an interesting concept where groups of people come together to play board games. I'd never seen something like this before. The place is relatively new, with nice modern decor and a wall filled with all kinds of board games on shelves in the back. Eight of us played Cards Agains Humanity, another first for me. Each round, one player asks a question from a Black Card, and everyone else answers with their funniest White Card. This is a game that definitely breaks the ice. We had a good laugh over the answers people came up with. Then some of the group continued playing other games like Jenga and Monopoly, while others pull out their sketchbook to do a little sketching and chat. I also got to sample some of their food. Their menu looked really appetizing. I had a hard time choosing and finally decided to go for the Roll Play pizza and tea. It was really good. The place was packed. We stayed for a couple hours but had to leave earlier than planned to let others play as well. It's probably an income thing, but. I think it would be better if they also sold alcohol so that groups that stay longer would also be lucrative for them. In any case, I had a great time and they gave us dices as parting gifts. We then moved to a coffee shop around the corner to continued our conversation for a couple more hours.